Comments: Hopkins Hardin was a Confederate soldier, who served in Company C, 19th Virginia Infantry. At the age of 23, he entered Company C in April 1861, enlisting at Scottsville, Albemarle County, Virginia. He fought in all of the principal battles and skirmishes of his division, taking part in such actions as those at Bull Run (first and second battles), Williamsburg, Fredericksburg, Boonsborough, and, last all, he was in that great decisive battle which determined the fate of the Southern Confederacy, the battle of Gettysburg. In this battle, Hopkins was wounded three times; he had been wounded previously at both Fredericksburg and Boonsborough. There was no question as to his bravery, his ardor, or his enthusiasm in battle. 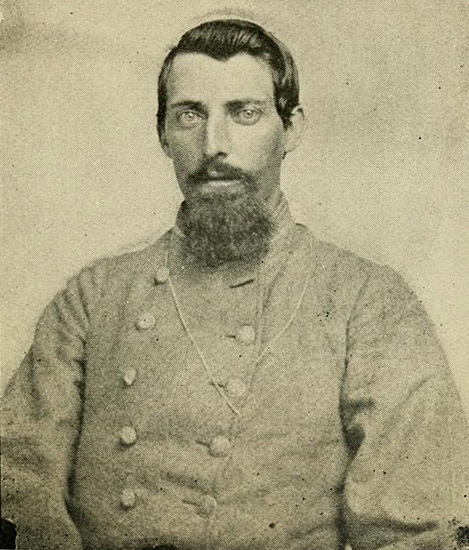 Young Hopkins Hardin was a dedicated Virginia soldier. At Gettysburg, Hopkins was unfortunately captured, after an active military service of over three years. From that time until his release at Ft. Delaware in June 1865, nearly two years, he suffered the hardships of a prisoner of war. Some of his privations and sufferings were unusual. He saw the inside of the Federal prisons at Ft. McHenry, Point Lookout, Ft. Delaware, Morris Island, and Ft. Pulaski. At the latter place, the prisoners were fed on bread and pickles for forty-nine days in retaliation for the treatment of Federal prisoners at Andersonville. Many died, and few were able to walk at the end of the 49 days. Lieutenant Hardin was one of the 600 Rebel prisoners who were placed outside the Federal breastworks at Morris Island, where for weeks they were exposed to the shot and shell of their friends, who were bombarding the place. Lieutenant Hardin's life was saved once by a note-book. It arrested the flight of a Minie ball speeding straight for his heart. A jagged hole was torn through a number of the leaves of the book. The bullet stopped when it reached an old yellow paper, which it cracked in four parts without penetrating. The yellow paper was a document authorizing Hopkins Hardin to exhort in the Methodist Episcopal Church. Lieutenant Hardin has long been a resident of Missouri, and he has been a successful farmer and business man. He resides with his family in Independence, MO. Battles and Biographies of Missourians: The Civil War Period of Our State by W.L. Webb (Kansas City, KS: Hudson Kimberly Publishing Co., 1900). Cornell University Library, Chapter XXXIII, p. 337. Hopkins Hardin was born on September 18, 1838, near Scottsville in Fluvanna County, Virginia. His parents were Hopkins Hardin, Sr., and his wife, Amanda. Hopkins Hardin married first, Elizabeth S. Thomas (1841-1873). After his first wife's passing, Hopkins married a seccnd time to Susan Lavina Westmoreland (1849-1918) in Jackson County, Missouri, on October 25, 1874. The Civil War record for Hopkins Hardin notes that he enlisted on 17 Apr. 1861 as a Private in Co. C, 19th Virginia Infantry Regiment, in Scottsville, VA. Hopkins was promoted to a full Corporal on 20 June 1861 and promoted to full 1st Sergeant on 30 April 1862. Hopkins was promoted to a full 2nd Lieutenant on 13 April 1863. At the Battle of Gettysburg, Hopkins was severely wounded with a gunshot wound to his back and became a POW on 3 July 1863. He was hospitalized and imprisoned in Federal hospitals and prisons in Gettysburg; Baltimore, MD; Ft. McHenry; Pt. Lookout; Ft. Delaware; Hilton Head, SC; Ft. Pulaski, GA; Ft. Delaware; and finally to Hilton Head, SC on March 12, 1865. It was in Hilton Head that Hopkins Hardin took the oath and was released from Federal custody on June 12, 1865, and was listed as being 6 ft. 1 inch tall with dark complexion, blue eyes, and brown hair. By the 1870 U.S. Federal Census, Hopkins was living in Jackson County, Missouri, where he worked as a farmer. Hopkins Hardin passed away at age 87 on February 13, 1926, in the Confederate Soldiers Home in Higginsville, Lafayette County, Missouri; Hopkins is buried at the Confederate Cemetery in Higginsville. 1850 U.S. Federal Census, Fluvanna Co., VA; Roll:M432-944; Page: 11B; Image 28. Missouri State Archives; Jefferson City, MO, USA; Missouri Marriage Records, 1805-2002(Microfilm); Marriage Record of Hopkins Hardin to Susan L. Westmorland, 25 Oct. 1874, Jackson, Missouri. Missouri State Board of Health, Certificate of Death, Hopkins Hardin, Lafayette Co., MO; File No. 5114, d. Feb. 13, 1926, Higgensville, MO; born 19 September 1838, Scottsville, Virginia.